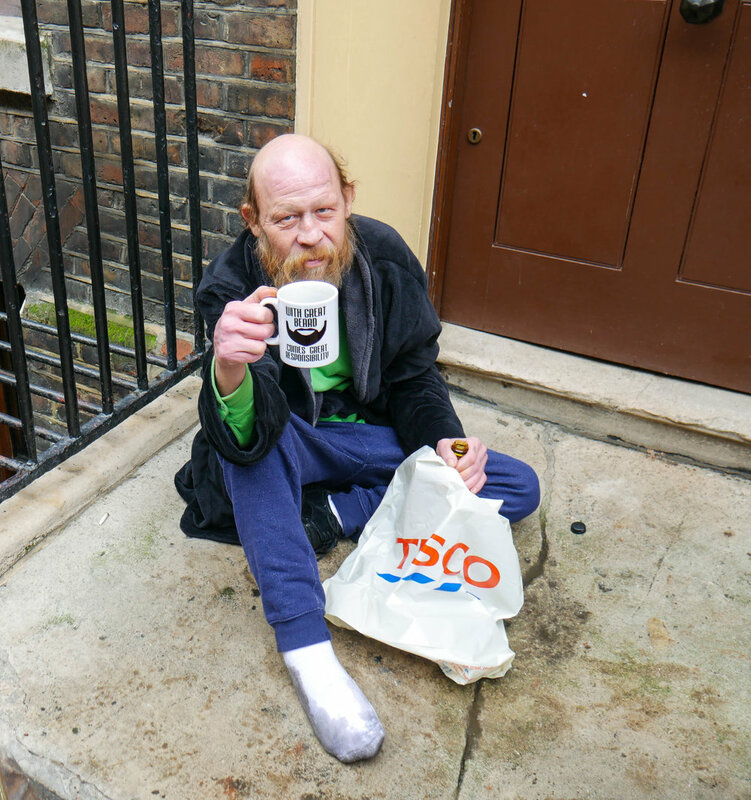 Tara and George is a six-part radio series about two rough sleepers in Spitalfields, they’re neighbours (albeit with no homes) in the historic London area where Audrey Gillan lives. It was a Falling Tree production for BBC Radio 4. Tara and George has been nominated for the prestigious British Press Guild Awards for radio show of the year. The Observer made it the number one choice in the top ten radio shows and podcasts for 2018, with the journalist Miranda Sawyer writing about “producer-presenter Audrey Gillan’s beautiful, in-depth series on a couple living on the streets of east London”. In her initial review, Miranda said it was “an astonishing piece of work that would not have been broadcast even five years ago”. Audrey wrote about homelessness and the making of the programme for London’s Evening Standard. To all appearances a couple, Tara and George are happiest when they have a big bottle of cider, a packet of cigarettes and are sitting cross-legged on the doorstep of the early Georgian house belonging to iconoclastic art duo Gilbert & George – sometimes they listen to the radio or sing songs, sometimes they sit in silent communion. Journalist Audrey Gillan lives around the corner from this doorstep and has known Tara and George, in passing, for years. But nearly two years ago now she started recording chats with them, amid the noise of the streets – bin lorries, motorcycle couriers, skateboarders. Audrey was interested in trying to tease out what has led them to a life on the streets. That is the question at the heart of this six-part series – along with a desire to understand why the pair remain there. With time to talk, and someone to listen, Tara and George share sometimes confused glimpses of their pasts – happy and sad memories slowly reveal chaotic upbringings and troubled teenage years. Difficult family relationships emerge. The narratives are complex and often contradictory. Time can be fragmentary for them and memory, at times, unreliable. Both hard drinkers, Tara is 48, George is 47, and their health is ailing. Life exposed to the elements – temperatures of more than 30 degrees in summer and the bitter cold and sometimes snow of winter – is harsh, but these two prefer to be outside. As George says, indoors “has never been my cup of tea”. ‘Tara and George’ is a love story, of sorts. One that’s hard to pin down. Each provides for the other an anchor, something to hold onto. Together they seem more resilient, better able to deal with the vagaries of street life, than they might on their own. But Tara and George have their own individual stories that deserve to be heard. Tara and George was a Falling Tree Production, made by Audrey Gillan and Alan Hall for BBC Radio 4. Beyond Tara and George is a single episode follow-up to Tara and George, broadcast by BBC Radio 4 on 11 February 11, 2019 at 8pm, another Falling Tree production, made by Audrey Gillan and Alan Hall. “In the six months since Radio 4 shared the stories of Tara and George, a pair of rough sleepers on the streets of east London, the government has published statistics that reveal the true toll of being homeless – last year there were nearly 600 deaths on the streets of the UK and the average life expectancy has fallen again. “Tara and George, as well as being familiar figures in their neighbourhood, are also on the radar of local agencies and charities. George has a regular hostel place, Tara's situation is more complex. But, as they revealed to Audrey Gillan in an intimate series of documentaries last summer, sleeping rough is typically a symptom of myriad other issues.